This week's new release: "Sicario: Day of the Soldado," starring Benicio Del Toro, Josh Brolin and Isabela Moner ("Transformers: The Last Knight"). In this sequel to the critically acclaimed "Sicario," American agents are sent into Mexico to start a cartel war, which will give the U.S.A. the excuse they need to start a war. But when the teenaged daughter of a drug kingpin sees too much, it leads to a moral quandary for these government-sanctioned murderers. "Sicario: Day of the Soldado" is a sequel that lost its star, Emily Blunt. It also lost its soul. Without the character of FBI Agent Kate Mercer to witness the atrocities, and provide a moral and ethical compass (even if she gets shattered by the end), the events of this franchise pass by with all the philosophical examination of a drab 9-to-5 day job. Framing people for murder and kidnapping, and starting a war with another country for selfish and despicable reasons, is just another Tuesday for these people. It's an attitude that makes the visceral thrills of "Day of the Soldado" come across as some form of cruel mania. If you point your camera directly into the abyss, that's all you'll get. You need someone adding commentary to redirect us back from the madness, or at least to remind that what we are watching is, indeed, mad. I see in "Day of the Soldado" a distant echo of Guillo Pontecorvo's brilliant, but rarely seen "Burn!" (a.k.a. "Queimada"). 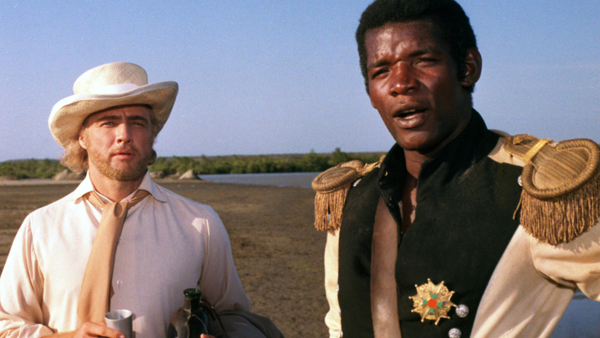 In the film, Marlon Brando plays William Walker, a British agent sent to stir up a slave rebellion in the Caribbean, in order to manipulate the sugar trade. In the first half of the film that's exactly what he does, and in the process installs a puppet leader named José Dolores (Evaristo Marquez), to serve Britain's interests. The problem, for Walker, is that Dolores becomes an actual leader to his people, and soon revolts against the British. So Walker is called back in to stop Dolores, who is only living up to the ideals that Walker taught him in the first place. It's a conflict that brings out the best in Brando, who said he did "some of [his] best acting" in this movie, and he's matched well by Marquez, who lives as complete a life in "Burn!" as any actor has in any movie. 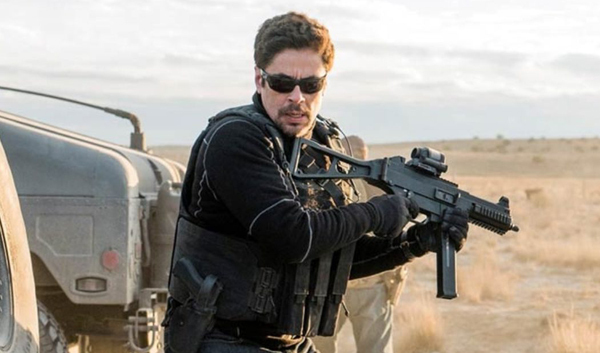 What "Sicario: Day of the Soldado" treats as humdrum plot, "Burn!" elevates to high art. The film does not accept the evils of politics, it considers the ramifications and challenges them. It is not a work of cruelty, even though cruelty is at its story's core. When one sees Stefano Sollima's “Sicario: Day of the Soldado” they may be struck by the intensity of its action and the grisly nature of its violence. One may appreciate – as I did – that it jettisoned much of its predecessor's depressive tone, streamlining its gritty events into something resembling a shoot-'em-up action picture. One may also take note of the film's excellent performances; Josh Brolin – in his third high-profile sequel of the year – effectively reprises his role as the no-nonsense-and-perhaps-no-soul CIA strongarm Matt Graver, and Benicio Del Toro gets to dig deep into the mostly-blackened heart of Alejandro Gillick, the vengeance-inspired assassin with perhaps only one or two qualms remaining. But whatever one takes away from “Soldado,” it will be primarily recalled for its unfortunate curse of bad timing. “Soldado” is a film all about immigration and border security, and it had the massive bad luck to be released on this particular month in 2018. Because of the current presidential administration's actions at the Mexican border over the course of the last few weeks, it's hard to look at “Soldado” and not immediately recognize that it was made in a previous era. This happens to films sometimes. They are made – effectively and with a good deal of talent – only to be negated by current events. As such, I would pair “Soldado” with a B-feature that suffered a similar fate, Barry Sonnenfeld's excellent screwball comedy “Big Trouble” from 2002. “Big Trouble” is based on the first novel by Dave Barry, and nails the famous columnist's eye for the absurdity of the banal. “Big Trouble” features an excellent all-star cast (Rene Russo, Zooey Deschanel, Stanley Tucci, Ben Foster, D.J. Qualls, Janeane Garofalo, Patrick Warburton, Tim Allen, Omar Epps, Heavy D, Andy Richter, Jason Lee, Sofia Vergara, Dennis Farina, Tom Sizemore, Johnny Knoxville) and weaves together several opaque crime-related story lines in a fashion that is reminiscent of “Clue.” One of those plots involved a miniature nuclear bomb – about the size of a garbage disposal – being carried lackadaisically onto a plane where it nearly kills all the passengers. This plot was played for laughs, as airport security was lazy and no one was paying attention. “Big Trouble's” original release date was September 21st, 2001. Because of events from ten days before, you may be able to see why that last plot line may not have gone over very well with American audiences. People were in no way ready to laugh at bomb-on-a-plane humor in 2001. “Big Trouble's” release day was pushed back to April of 2002, but the damage was still too fresh. This rather brilliant comedy landed with a thud, and is no longer remembered. Watching it today, one may find it to be hilarious (as I do), but they would have to (as I do) regard it as a relic from a previous era. There was a time when that sort of joke was funny. Maybe in 2018, we can laugh at it again. Maybe not. But “Big Trouble – like “Sicario: Day of the Soldado” – has been lost to current events.